Nearly 10 years ago, I drove up to my house the evening of September 11, 2001. At the entrance to my road, I came upon several government agents blocking my way with machine guns in hand. They had me exit my vehicle and take Cameron, then 17 months old, out of his car seat so they could search my truck. Although the roadblock wasn’t exactly surprising since I live on the road leading to the infamous Mt. Weather government installation, I didn’t expect that I’d be considered a suspect in terrorism. Now, I’ve learned that anyone could be a terrorist, from the mother of a newborn to the ailing senior citizen hobbling along with a cane. Tonight, it was different, though. As I approached the same intersection, we saw a lone figure standing on the hill. He didn’t have a gun or a uniform on, instead he was standing proudly in his jeans and T-shirt waving a full-size U.S. flag and smiling to the passing drivers. We waved back. Then it really hit home, how the death of Osama bin Laden has changed us. Perhaps we didn’t realize it when we heard the news this morning, but now, seeing this proud American citizen celebrating freedom in his own small way made a huge impression on me. Cameron, who was just a toddler during 9/11, understood, too. We talked about the meaning of today’s historic announcement and how the world was changed after Osama bin Laden targeted our country. We were both inspired by the actions of this flag-bearing man and brought out our own flag, which had been in the closet since last July. 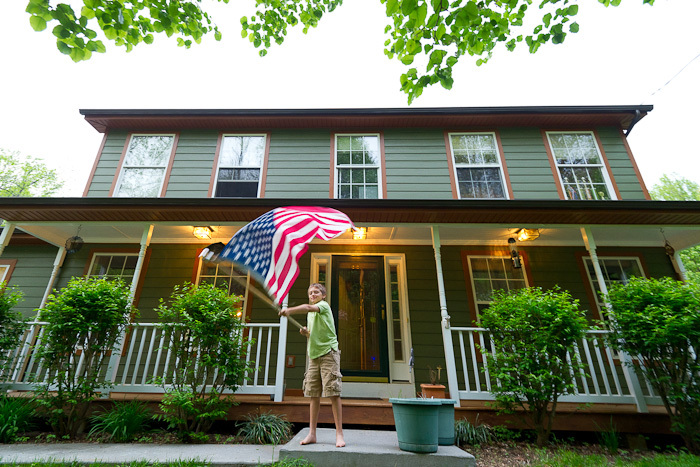 After Cameron joyously celebrated our patriotism, we carefully displayed it on our front porch. It’s the perfect time to remember all of those who have died for us, both in war and in peace, and the stars and stripes waving on our flag pole is a daily reminder. This is truly a great time for America. Finally, all those families that suffered so much on September 11th as well as all other Americans can finally have a sense of closure. This is a fantastic country. We all should revere and treasure it. Thank you for your awesome pictures and Post every day. I sure enjoy them.